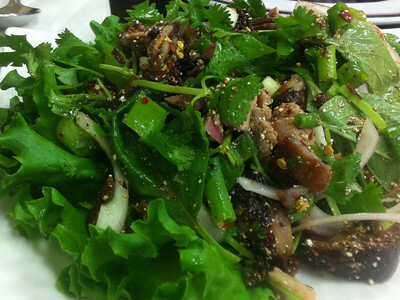 Larb Phed Yang – A chunk of roasted duck mixed with rice powder, chili powder and lime based salad dressing. Lers Ros is a popular thai restaurant in tenderloin. Some say it is as good as Portland’s Pok-Pok. After looking at Yelp and Chowhound, we decided that Larb Phed Yang (duck salad) was a must have. We also decided to get the alligator from the special lunch menu. The salad didn’t disappoint, the duck was moist and the whole dish packed a multitude of flavors that one tends to associate with south asian dishes. Raw onions had mellowed out in the lime. Basil leaves and coriander paired well with duck meat. Rice powder, somewhat grainy in texture like cornmeal, had added a crunchy texture to the duck meat which was itself cooked perfectly. 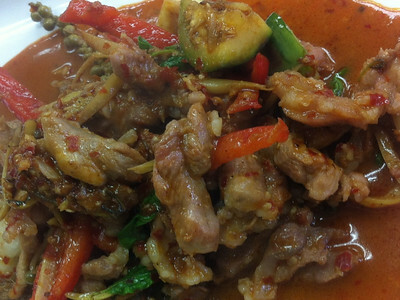 Flavors of Pad Ped Alligator were equally satiating. The curry didn’t have a coconut base and reminded me of Indian style curries. In particular I liked the fact that the quantity of green peppercorn was generous and I could actually taste them, they tasted like sichuan peppers without the numbing effect. Unfortunately, alligator meat itself was overcooked. We went in on a weekend lunch expecting a crowd but there weren’t any. 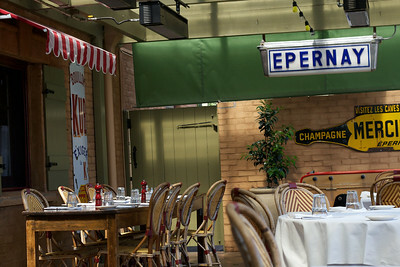 Restaurant itself is fairly canteen style. Staff is friendly and the menu is extensive. Although I won’t put Lers Ros in the same bracket as Pok-Pok, I am definitely returning. If it were my neighborhood restaurant, I would be doing take outs fairly frequently. Our local pastry shop, “Sugar Butter Flour” serves up excellent pastries. 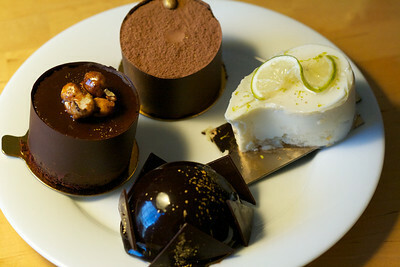 Here is a loot from a recent trip – tiramisu, chocolate hazelnut, flourless chocolate and a key lime mousse. Washington Street in Yountville has been taken over by Thomas Keller. 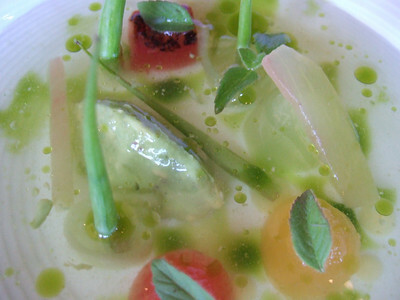 So, holding your own out here has perhaps been fun for the rest of the great chefs in Napa. 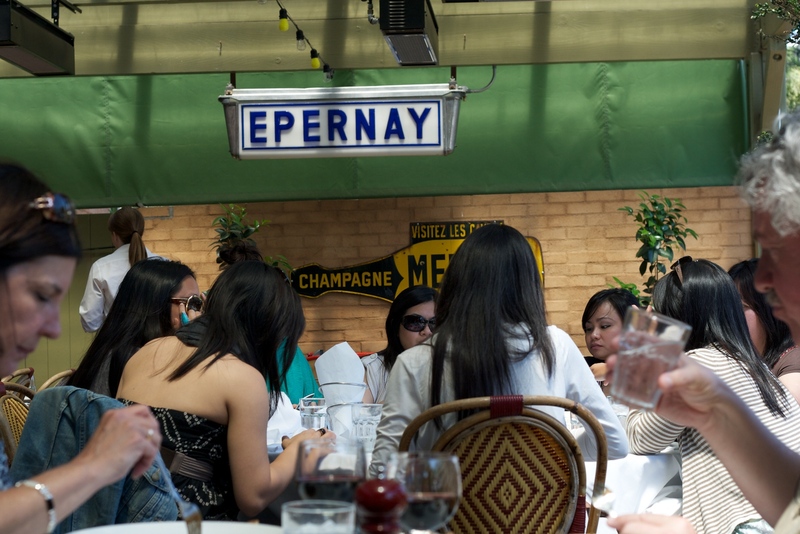 Nearly a decade ago, we ate our first lamb tongue dish at Bistro Jeanty and instantly fell in love. 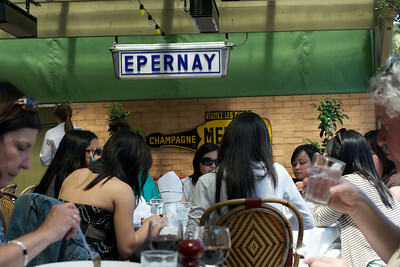 Now that we have been to Paris pilgrimage, we can safely assert that the food here is authentic French bistro cooking. Ambiance is Californian, with golden sun, crisp air, and spacious seating. On a summer day, sitting out on the patio, sipping one of the local Napa wines is a delight. Here is what we ordered this time around: Warm lamb tongue salad, pigs feet, duck and goat cheese pate’, butter cooked snails, a bottle of their table red and a plate of cheese for dessert. 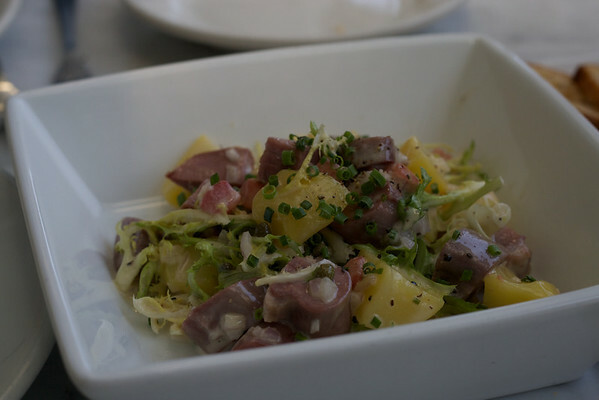 Lamb tongue is mellower and sweeter meat compared to rest of the lamb and was served the same way as we ate a decade ago, with warm potatoes and salad greens, a light and delightful dish. Pigs feet was slow braised, the fork tender meat was shaped into pig feet shaped log, coated with flour and deep fried – a bit on the heavy side. Rillettes was rich but it was mellow and sweet on the nose. 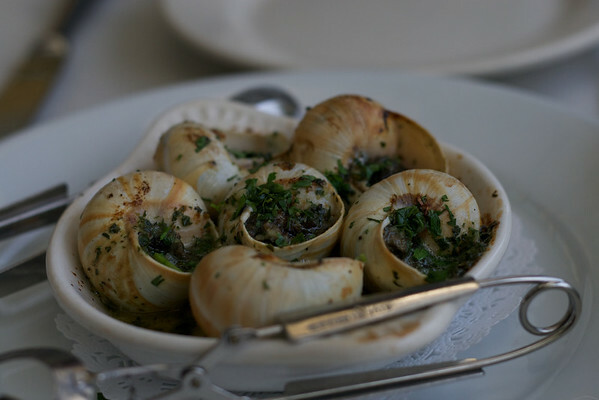 Snail came with a lot of heavenly butter. I unloaded each snail on a slice of baguette, perhaps 1/2 a teasoon of butter per snail. Yummy. A light red wine and my better half provided delightful accompaniment to the meal. “It was a sublime evening sitting in front of Chef Syhabout and his team.” “The educated love of food is evident in every offering.” “… studied grace of the kitchen …” “I was left speechless and incredulous.” Reading people’s comments on Commis sounded as if Ferran Adria himself had moved to my neighborhood. So before he decided to move shop from Oakland to somewhere where there is more there there, I decided to sample what others had been raving about. We live in part of San Francisco Bay Area that is famous for Korean food. So when the popular south Korea based franchise, Bon Chon Restaurant, opened a branch in our neighborhood strip mall, it was a pleasant surprise. I wasn’t quite sure what to expect when I got in. My neighborhood hole in the walls are just that. Decor is typically non-existent. Menu is minimally put together. Furniture, floor and walls have a beat up look. The wait staff is typically a first generation immigrant who speaks rudimentary English. 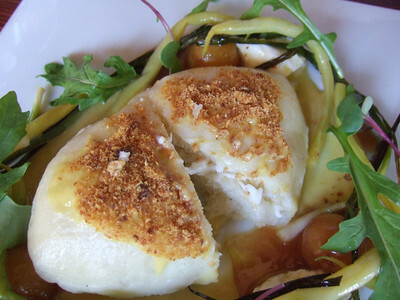 But this is an immigrant community and while these restaurants are not for special occasions, they can serve up a dish or two that are expertly put together. In general, fried food in Asian cuisine is less greasy. Korean tastes are fiery. So, it is fair to say that I was expecting a less greasy and more spicy version of southern style fried chicken from a fast food joint, a Korean McDonald. 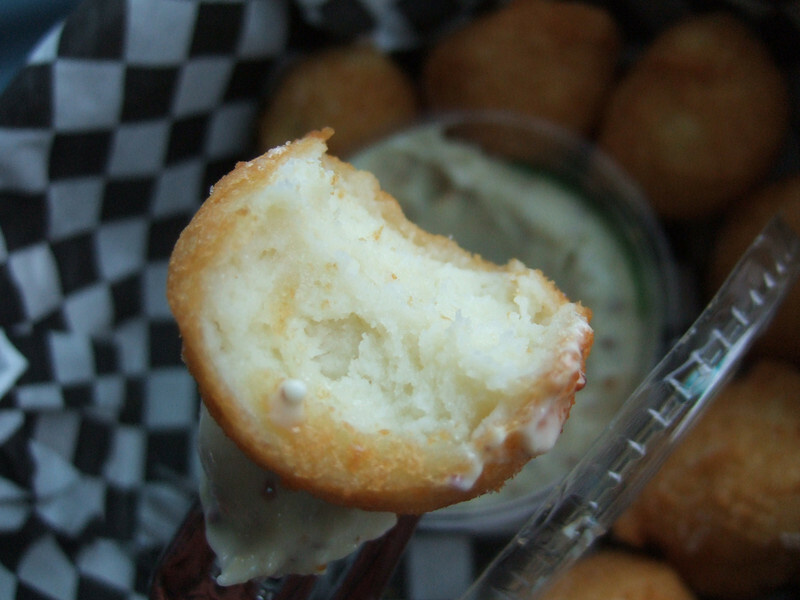 Grégoire’s – can I have some fried mashed potatoes to go? Winters are a little drizzly around here. On these drizzly weekends, in lieu of long walks on the hills of Bay Area, we often find ourselves staying home with reruns of Firefly and surviving on samosa sandwiches. 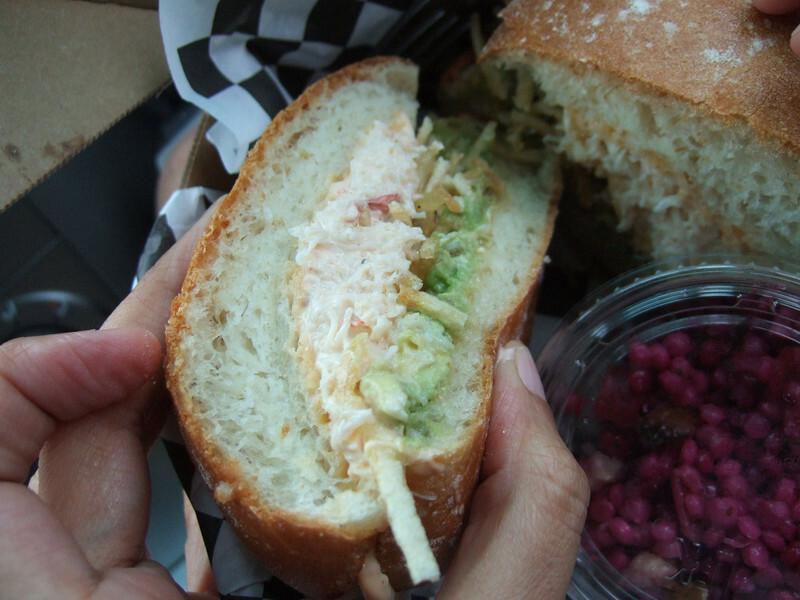 A few weekends ago, we decided to change the drizzly weekend routine and drove out to People’s Republic of Berkeley with the idea of lunching at Gregoire’s, a small hole in the wall that is purported to serve up gourmet lunches. 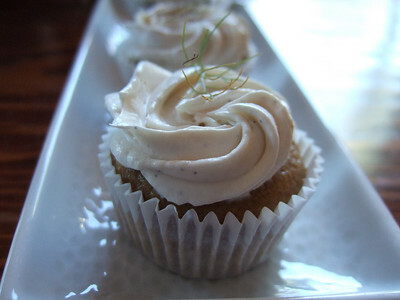 Someone was bound to combine two of San Francisco bay area’s favorite pursuits – yoga and food. 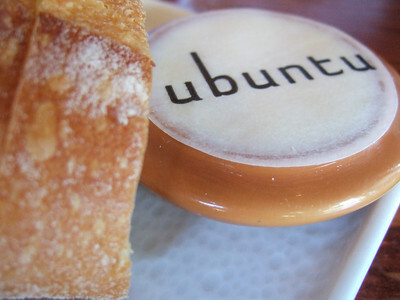 Ubuntu in California’s Wine Country bills itself as selling just this combination. We visited only the restaurant half of the strange amalgam, but did not fail to appreciate the lithe yogis and yoginis passing by the large bay windows. I suppose once you have decided to combine a restaurant with a yoga studio, you cannot really serve up cow or pig or any of god’s tasty creatures. So you end up serving vegetarian/vegan food. Sort of. There was egg on the menu. Vegetarian/vegan food is such a departure from mainstream American tastes and practices that I usually approach it with trepidation. I am always afraid that I will be served some prettily arranged steamed peas and tofu decorated with fresh herbs, and that I am going to do something really seriously nasty. Like write a blog post.